This activity is to teach younger students about traffic safety for our transportation unit, as well as promote fine motor development. 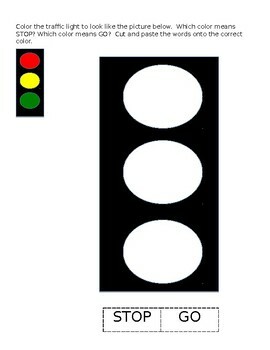 Students color in the traffic light according to the example and then cut and paste the words to go on top. For younger students who are unable to read, either ask them to count the letters (the word with four letters is stop, the word with two letters is go) or point out each word and have them match it. This document is in word so you can edit it as you please.